So I had a LASIK eye surgery 48 hours ago as I write this post, and here are my few pointers if you are planning to have it as well. First of all, my eyesight was not as bad and my number was -1.75D and -2.25D in right and left eye respectively. I also had cylindrical power. Wearing glasses, specially when you are out in sun is cumbersome (shifting glasses and shades…too tiresome I tell you). And on top of it you have to get the power-sunglasses. If you have a habit of wearing lenses, you cannot wear it for long long hours. My eyes tend to get dry when I wear lens and it gets too uncomfortable by the end of the day. So I finally gave in and had the LASIK eye operation. They first cut your cornea and make a flap, then they burn and reshape the cornea with laser and finally close back the flap. I went for pre op eye checkup one week before the actual surgery. They do various tests like cornea thickness, pupil dilation test, retina test etc. and tell you if your eyes are actually fit for Lasik operation. Just anyone CANNOT have this operation. For example, if your cornea thickness is less they themselves will not advise you to undergo this operation as it involves burning of cornea tissues to reshape it. Tip: Go for this checkup in the evening or on a holiday. Pupil dilation test will cause blurriness and you will not be able to read/see clearly for 4-5 hours. Also you MUST carry your shades as you will NOT be able to step out in the sun without it. Your eyes become too light-sensitive. They advised me to stop using lens right away if I am planning to do this surgery anytime soon. They gave me an antibiotic solution to drop in my eyes 3 days before the surgery. They also advised me to stop wearing any eye makeup 3 days before the surgery. On the day of surgery I was asked to have a head bath as I won’t be able to wash my hair for about 7-10 days after the operation. I was asked not to apply any deodorant or perfume on the day of surgery. On the day of surgery, they did some checkups and put some eye drops in my eyes 3-4 times about half hour before the surgery. They made me wear a head mask and taped it on my forehead till my eyebrows. This was to prevent hair from coming on the face during surgery. In the operation theatre, I was asked to lie down on the recliner (Do not tie your hair too high or in a bun or it will be uncomfortable when you lie down. I tied my hair in a braid). The recliner had a cavity/depression for your head to get you comfortable while you lie down and exactly on top of your face is the machine. They put some drops in my eyes which made them numb to any pain. Then they put some kind of mask thing on my face and cut the portion for eyes. The rest of the mask was removed. It was sticky or they were using any suction to hold it in place, I don’t know and they pressed it securely under my eyelids and put clamps to make my eyes as wide as it can be. I could not blink thereafter. The other eye was closed. I was asked to see a red blinking light on the machine in front of my eyes throughout the operation. They first added some wetting liquid to avoid dryness. Now, I couldn’t see any of the things they were doing except the red light but I knew what was going on as I had read beforehand about the procedure. So after dripping the liquid on my eye they put a machine kinda thing and pressed it against my eye. The red light I was supposed to see sort of went out and I could hear a faint motor-like noise. This was when they were making an incision on my cornea to make the flap. I didn’t experience any pain but only some pressure. I have read people say it is a lot and lot of pressure, but I tell you it’s not A LOT but bearable. I could see the red light again. So after making the cut the doctor flipped open the flap and the red light I was supposed to see went out of focus. It was there but out of focus. Then they switched on the laser to burn the tissues. It didn’t pain as I said, but yeah I could feel something was happening. The burning tissues gave an acrid smell, the likes of hair burning, if you have experienced it. IT WAS BAD. I could also notice slight smoke. The laser went on for about 20 seconds, depending on the power of your eye. More the power, for more time they use the laser. The reason for ‘burning’ is to make the cornea flatter, so that the image can focus on retina for 20/20 vision. After the laser, they dripped the liquid again and put the flap back. They applied some air on the flap, then wiped it many times with something to press the flap firmly on place and remove any bubble. They wiped it many times. Lastly, they put a lens on my eye. 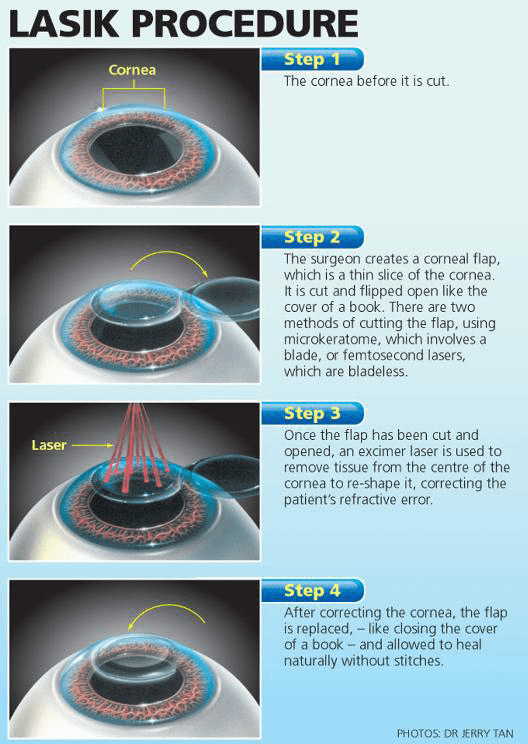 The lens is placed to protect the cornea and aid the healing of the cornea flap. The clamp was removed and the same thing was carried out for left eye. The whole thing took about 15 minutes in my case, but others took as long as 40-45 minutes. As soon as I got out of the OT, I didn’t see a DRASTIC difference, only my eyes felt very weak and heavy. I couldn’t open my eyes. They asked me to keep my eyes shut for 10-15 minutes and did some checkup after that. As I said I didn’t notice any DRASTIC difference, maybe because my number was not that much, plus the discomfort and dryness didn’t let me see the difference much. All I could notice was that everything was hazy. And by that, I mean A LOT hazy. There were halos and glare. Something like this. F***ing HELL DISCOMFORT in eyes the same day when I came back home. My eyes felt weak, tired, super-dry, slight burning and swelling and I could not open my eyes. The closest feeling I can imagine is when your eyes get dry after a long day of wearing lens, only 20-30 times worse than that. I had a gritty feeling in my eyes. I was asked not to touch my eye at all. The doctors advise to close eyes and go to sleep. But I was not at all sleepy which further added to my discomfort. They should have given me some sleeping pill or something. Since I was not to even touch my eye , let alone rub it or poke it, I slept wearing my super-sized sunglasses so that I don’t accidentally rub my eyes. They did not give me any kit post Lasik. Also you are asked not to apply any eye makeup for about 2-3 weeks. Day 0 i.e the day I had surgery – Super discomfort, dryness, tired eyes, gritty/sandy feeling, redness, haziness, halos and glare, light sensitivity. Day1 after the surgery – The discomfort had vanished considerably, I did not feel restlessness like I felt after the surgery. But the vision was not perfect, the eyes were still dry, gritty-ness was still there. I had to go for 1st post-operation visit the next day. They did some checkups, added drops to my eyes and removed the lens they had put after the surgery. I felt better after that as the dryness and gritty-ness had reduced to a great extent. They gave me some oral medicines to speed up the healing process. But haziness, halos and glares was still there, my vision was still not perfect, better than before surgery no doubt, but still not perfect. Day 2 after the surgery– Eyes are even better, dryness has reduced, haziness has reduced though still there, but eyesight still not perfect. My vision is still not ‘crisp clear’. Halos and glares still present. A faint feeling of gritty-ness is still there. I cannot see far objects clearly and my eyes strain and pain if I try to. I asked the doc, they said it will take some time. Eyes take about 3 months to recover fully after the LASIK operation. My next follow up visit is after 1 week. The whole procedure cost me 35 grand. I didnot opt for the bladeless procedure. The only difference is in the method of making the incision to make flap. In bladeless procedure they use a laser to do it. Rest of the things are same. Bladeless one costs 85k INR. The recovery time, the dryness and everything else is the same in both the procedures. I got my eyes lasered at Optical Express last year and find it interesting reading someone else’s experience in such detail. In regards to avoiding getting water in your eyes, I was actually given protective goggles by Optical Express which I feel made me so much more confident in the recovery stage.